The Big Issue is a public benefit organisation. Every month it produces a magazine with the help of celebrated writers and thought leaders. Vendors buy the magazine for R10 and attempt to sell it on street corners throughout the city for R20. Before this project began in 2014 these micro-entrepreneurs sold, on average, 5 magazines a day. This means that they often ended their long, hard days at a financial, psychological and emotional loss unable to cover even their transport costs. They described themselves as feeling “invisible”, “rejected”, “ignored”, “degraded”; like they “didn’t exist”. With unemployment, inequality and poverty a real and rising problem in South Africa, encouraging empathy, engagement and pro-social behaviour towards vendors whilst ‘humanising’ them, boosting their sales and confidence was no easy task. The Gravity team set out to understand vendors’ interactions (or the lack thereof) with motorists through hours of observation, interviews and coming to understand each vendor, their ‘big issues’ and experiences, as well as those of their potential clients, many of whom drive these routes daily. Through a careful combination of ethnographic market research, behavioural economics, psychological theory and behavioural design principles, with just a few small and subtle changes, the ‘Smart Bib’ was born. Primarily it sought to ‘humanise’ vendors by encouraging them to handwrite what “My Big Issue” was. These ranged from “making a living” and “staying positive” to “supporting my family” and “saving for a home”, and were integral to encouraging empathy and visibility on a one-to-one level. The Smart(er) bibs also included a small transparent sleeve in which vendors could display the number of magazines that they had left to sell that day. Aside from further personalising each person and their purpose, actively seeing the number diminish would also motivate motorists by highlighting the difference that their individual contribution could make. Over the course of the day, or even a 3 minute wait at a traffic light, motorists and passengers could quickly, clearly see the dramatic difference that every short, simple low-cost purchase can make. Next, key partner Snapscan was brought on-board. Each vendor was equipped with a Snapscan QR code removing the necessity of carrying cash, on top of the delays involved in providing change. In a matter of seconds clients can now scan the QR code, enter their four-digit pin and make a purchase. The use of Snapscan was even more significant on a much more personal level. A key issue identified by research was the safety and security of the vendors, many of whom are middle-aged women. They said that they often felt like vulnerable ‘easy targets’ on their long commutes home as people knew that they were carrying cash. Even once they made it home, their money wasn’t always safe; many women admitted that the men they lived with often took their cash for themselves. 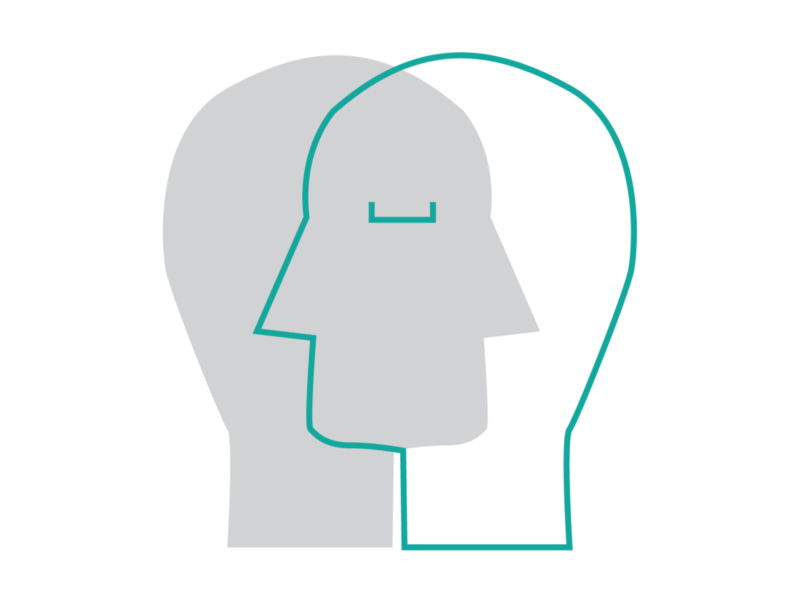 By directly depositing all of the proceeds into vendors’ personal bank accounts, the move to Snapscan not only works to prevent both of these issues, but also encourages financial and technological literacy amongst these micro-entrepeneurs. 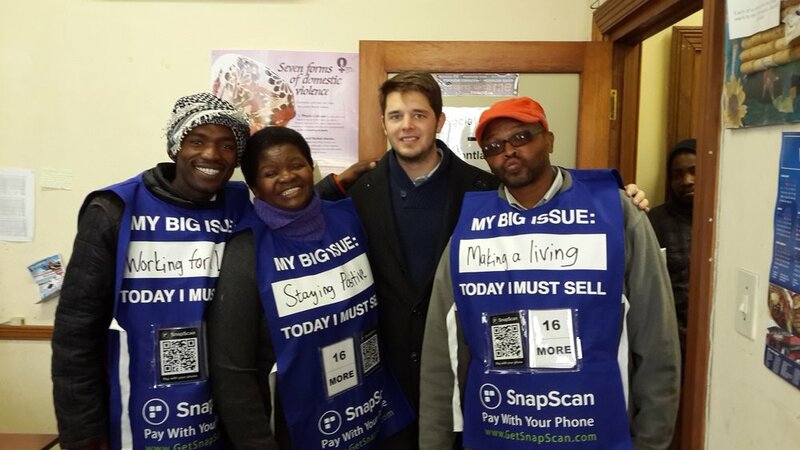 The Big Issue prides itself on being not a “hand out” but a “hand up”, empowering some of Cape Town’s most vulnerable with the skills, confidence and financial capacity to support themselves moving forward. The Big Issue entrepreneurs had reason to be excited. Following Gravity Ideas’ intervention the magazine sold out for the first time in 2014. They also recorded an increase of 360 magazines sold – an 8% boost in sales - in August 2014 just after the intervention. Importantly, this doesn’t just mean more magazines sold, but a real, remarkable difference in the lives of each of these individuals and those that they live with and support. This intervention has been screened worldwide at the Social Innovation Exchange Awards in Dublin, Ireland. 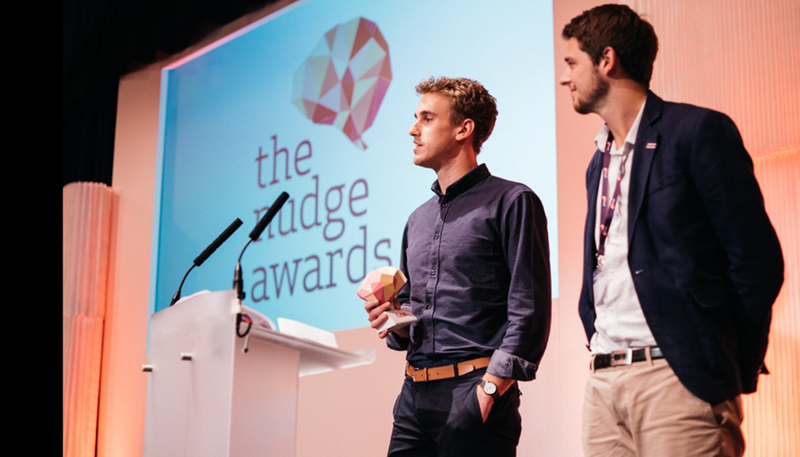 In 2016 Gravity Ideas was also awarded the grand prize at Nudgestock's The Nudge Awards - the world's premier behavioural science awards - as voted by the audience of industry leaders and academics. Cyril Mylambiso, a Big Issue entrepreneur for the past 4 years, notes how such work has changed his life. Cyril says he now has the confidence to be a better father to his children who he can now support. Phelokazi Kohlela, a 41 year old mother of 4, started as a Big Issue entrepreneur at the start of 2015. She says that, “selling the magazine isn’t easy. Standing all day is hard on my feet and being upbeat when you’re tired is not easy… But the people out there make it all worthwhile. The fact that I am supporting my family motivates me to get up and sell. The support from my loyal customers helps a great deal too… I am a hard-worker and I now know that I can do anything I put my mind to”. Download the full case study and get more insight into this intervention here. Should you have any more ideas on how Gravity Ideas or you can assist with this project, if you’d like Gravity’s help on a similar project of your own, or should you wish to personally get involved with Gravity Ideas or The Big Issue please do get in touch.